Rob Reiner is still here. With a​​​​ string of critical and box-office hits that began in 1984 with the cult favorite "This is Spinal Tap" and included such beloved films as "The Sure Thing," "Stand By Me," "The Princess Bride," "When Harry Met Sally," "Misery," Academy Award Best Picture Nominee "A Few Good Men," "The American President" and, to a lesser degree, "Ghosts of Mississippi," Reiner's success red-hot filmmaking career seemingly began to cool with 1999's "The Story of Us" and, in the eyes of many, came to a screeching halt with post-millenial films "Alex & Emma," "Rumor Has it," "Flipped," "The Magic of Belle Isle," and "Being Charlie." Since 2000, Reiner's only true hits have been 2007's Jack Nicholson/Morgan Freeman starrer "The Bucket List" and 2014's modestly successful Jack Nicholson/Diane Keaton film "And So It Goes." The truth is that Reiner, the co-founder of Castle Rock Entertainment and an Emmy Award-winning actor for the 1970's classic television series "All in the Family," is still around. 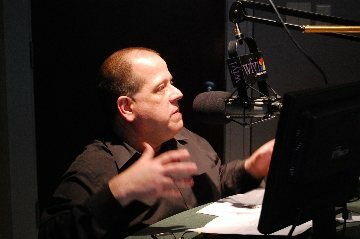 From acting appearances in such recognized films as "The Wolf of Wall Street" and television's "The New Girl" to a wide range of television and producing efforts including the upcoming series "The Tap" to his current directorial effort "LBJ" and the upcoming "Shock and Awe," Reiner continues making movies that matter and films that, while perhaps not the popular draw he experienced in the 1980's and 90's, continue to appeal those who appreciate his devotion to stories that celebrate life, diversity, and the joys and sorrows of being human. For the second time, Reiner is at Indianapolis's acclaimed Heartland Film Festival, a festival that seems practically tailor-made for Reiner's life-affirming, human spirit celebrating way of making films. Five of Reiner's films have been awarded Heartland's Truly Moving Picture Award including "Stand By Me," "The Princess Bride," "A Few Good Men," "Ghosts of Mississippi" and "Flipped." It's safe to assume that Reiner's latest film, "LBJ," which opens the 2017 Heartland Film Festival, will soon join them. Additionally, Reiner will be receiving the festival's "Pioneering Spirit: Lifetime Achievement Award" during his time in Indy. I had a chance to sit down with Reiner for a chat inside the Beijing Room of downtown Indy's Conrad Hotel where Reiner was preparing for his latest film's opening night screening. 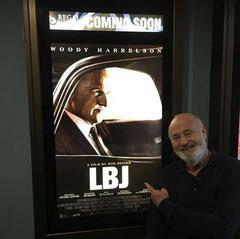 Legendary Director Rob Reiner Prepares for the Release of his Latest Film, "LBJ." You must really like it here! I do. I do. The reason I like it here is that in New York and L.A. there's a jadedness sometimes. Here, people are more open to taking in something and I think that if you have a film that people like here it bodes well for other places as well. Several of your films have actually won Heartland's Truly Moving Picture Award. Yeah, I like that. I like that Truly Moving Picture Award a lot. That's a great way of talking about my films. I wondered about that. What do you think it is that makes your films "truly moving pictures?" You know. I wouldn't really be able to describe it. They're movies about people where people can see themselves and the experiences and challenges they're going through on the screen. That moves them, I think to have the ability to connect with those characters. You seem to have a knack for creating those types of characters across genres and across different styles of filmmaking. LBJ is a perfect example. I have a lot of different types of movies that I've made, but I don't really set out to do that. It's not like I say "Let's do a thriller...let's do a romantic comedy...let's do a courtroom drama." I think about "How do you tell this story?" LBJ is what it is. It's a sliver of this guy's life and I wanted to give a good picture of what he was and moreso of what we have an image of him being. You know, kind of the whole bull in the china shop image and this arm twisting kind of guy. I was hoping to give a fuller picture of him. I just say "What's the best way to tell this story?" I've read that you were initially hesitant to tackle LBJ's story. I was. Growing up in the 60's, I was of draft age during the 60's and during the Vietnam War. I was against the war. I felt it was illegal and immoral and we shouldn't have been there. So, I hated LBJ. In my mind, he represented somebody who would send me to my death. I didn't have a good opinion of him. As time has gone by and I spent a lot of time in politics and working in California government for seven years, I learned to have a greater appreciation for what he was able to accomplish. I've often said that if you took Vietnam out of his presidency that he'd have gone down as one of the greatest presidents of all time because his legislative agenda was a masterpiece. Except for FDR, I don't think anyone's accomplished as much as Lyndon Johnson...Medicare, Medicaid, Civil Rights, Voting Rights, Head Start and it goes on and on. So, I really had a greater feeling about him than I did before. When the script came, at first I was a little hesitant. I said "Do I really want to go there?" Then, I read the script and I said "Okay, I can tell this story." He's a Shakespearean character. He's very complex. He doesn't fit into the hole that you originally think of. He had many insecurities and he was always frightened of not being loved. He had kind of a mental paralysis at times about moving forward. You don't see those sides to him usually. I thought this was the perfect opportunity. We only told a sliver of his life. There are flashbacks to when he was majority leader and then when he was thinking of running for president against Kennedy, but it's really only from the time of the day in Dallas when Kennedy was assassinated and he was assuming the presidency then giving that great speech to the joint session of Congress. That really was a great speech. It was. It was...and the film ends right at where he decides to go forward with the Civil Rights Act. So, you show this man assuming the presidency in the tough situation that he had. He was assuming the presidency from a president who was beloved and adored, but he's also deciding that he was going to move forward with that president's agenda. That, to me, is what we explored. We see his insecurities come out. For yourself, how did you reconcile that fairly wide chasm. You have this man who accomplished such amazing things during his presidency, but then you also did have this man who escalated the Vietnam War. Did you have to reconcile that as a filmmaker? Well, since the film really begins and ends in 1963 the Vietnam War had not really entered his picture yet. We don't even see him passing the Civil Rights Act and Voting Rights Act. We just see him teeing it up. So, to me it was more of a narrative study than anything else. It's not a bio-pic. If it were a bio-pic, then we'd go back to his beginnings and to when he was born in the hill country and raised in poverty and how he made it to the House and to the Senate and his rise to power. That would take many, many hours. That would be a mini-series on television. I do like that you showed his humanity and his insecurities. I thought you did that with the Kennedy's as well. There's most definitely antagonism between Bobby Kennedy and Lyndon Johnson. Jack was a little bit different about that. I think people can connect with it. They'll see human beings on the screen. I think that's amazing. When you look back at President Obama, I think he connected with people. On a level that at least feels like it's rare among presidents. Yes. Obama was able to do that. Clinton was able to do that. Reagan...Reagan could connect with people. You need to be able to do that. That was the thing with Johnson. He was always afraid that he couldn't connect with people and that the people wouldn't like him. He had to excel at his strong point which was getting legislation done. Was Woody Harrelson eyeballed early on to play LBJ? I wanted somebody from Texas. I wanted somebody that could bring some humanity to the character and somebody who had a sense of humor. Initially, there was only a couple of people that I thought of - Woody was one of them. I was really happy that he did it. When you see it, it's just amazing. It's incredible. I'll admit that I was a little concerned. I mean, the make-up and prosthetic makeover is so profound. I wasn't really sure I would buy into it, but five minutes into the film I found myself immersed and pretty much forgetting about Woody. I think it's one of his best performances. I think so, too. I hope that he gets nominated for it. I'd like to talk about your filmography a little bit. When I look over your history, I see some certain common traits. You've always kind of made the modestly budgeted film. Is that something you do intentionally? You know, Castle Rock and I have been together for about 30 years and together we've made over 125 movies and not one of them would have been made in the studios. They're all independent types of films. All of the films I've made, and I've made about 20 films, are independent type films. I think about the people more than I think about the hardware. To me, whatever it costs to make the film. I just like making movies. Whatever they give me to make the movie, I'll take. I'm not thinking about the big budget or little budget. I'm thinking "Do I have enough to tell this story?" All of your films truly have stories. I mean, you don't really go into the techno gadgetry. What would you do if somebody gave you $150 million or something like that and said "I want you to make the next Star Wars film?" That's funny, because when the Harry Potter franchise started there was some discussion. I read the book. The first Harry Potter book was really good and I said to myself "I could see young people really liking this." I thought "What's my way in here? What do I have to offer here? It's great and I think it's going to be an enormous success," and it was, but I didn't know what I could offer to it. That's usually how I approach it. I try to find my way into the script. Do you do that as an actor, too? I do. I try to. I would never ask another actor to do something I wouldn't do. I was looking at your filmography before I came over. I don't think you have, but have you ever made a sequel? No, because I did that already. Whatever it is, I did it already. It's done. We live a certain amount of time on the planet. So, there's no interest in revisiting one of your stories? We'll never get a Princess Bride 2? There's some people who've said "Why don't you do When Harry Met Sally again or another This is Spinal Tap?," but we did it already. You finished LBJ before the presidential administration changed. Yes, and it is a dramatically different film now. If you had seen this film before Trump became president, you'd have seen a different film. The film didn't change, but it did. You see it differently. The whole thing is different. The themes of it, civil rights and race relations, there's a lot of movies made about that stuff. For some reason, you know the reason, those issues have been brought to the floor again because of Trump. Now, all of a sudden, you're looking at all of this in a different light. I couldn't help but think of that while watching the film. You watch LBJ and you know Johnson's history and you know that he was, or could be, kind of this bull in the china shop. He was crass and brash and larger than life. The people I know in my life who voted for Trump, many of them will say that's exactly what they appreciated about him...he wasn't like other presidents. He's bold and brash and crass and doesn't play by the rules. How do they feel about him now? You know, I think most of the ones I've talked to about it support him less and I think genuinely believed he'd tone it down if he got elected. I think they're kind of stunned he hasn't. There are others, though, who seem to still feel like he's going to make America great again. They believe that it's worth dealing with all these side distractions because in the end he'll do the job. Wow. Trump did have that. He appealed to the people, but that's gone now. That gets you to the polls. That gets you elected, but then you have to do the job. Trump doesn't know and he doesn't seem to want to know, and that's what upsetting to me, how to actually do the job. That was part of what I found fascinating in watching LBJ. As a president, LBJ had all of these insecurities and vulnerabilities and all this baggage but he learned how to transcend himself to get the job done. LBJ was dedicated to making things work. Trump? I don't know what he does.I understand when you're trying to get elected and you're throwing red meat to the base, but now you're the president of everybody. LBJ is proof that you can do it. You're going to pay a price and LBJ knew he was going to pay a price. He knew he was going to lose the southern Democrats and he did. He said it would be for a generation, but it turns out it was many generations. You do what's right for everybody. I want to go back and talk about you as a filmmaker. You're an Emmy Award-winning actor, but I've read that you didn't really feel successful until you started directing. Is that an accurate statement? I started out acting and directing. I had my own improv group when I was about 19-years-old. I acted and directed in that. I always thought of myself as a director. I like acting, but even when I was acting I was always aware of the other actors and I was always asking the other actors what they were doing and what the cameras were doing and so on. So, when I got to do films it was like "Oh, okay. This is what I'm meant to do." Are you an actor's director? I think I am, because I've been there. You know? Like I said, I would never ask an actor to do something I can't do. I'm not the best actor in the world, but I'm decent. I know what an actor can and can't do. I would never say "I want you to make this transition and walk over there and do this and so on" because I know what it takes for them to do things. I know what they can and can't do. I think actors make really good directors. I want to ask a question. Obviously, you've been nominated for an Academy Award. You didn't win...now, maybe I shouldn't bring this up but I'm going to. You can always hit me or just refuse the question. I'm not going to hit you (delivered in the most perfect Meathead voice). But you've also been nominated for a Razzie Award. A Razzie? What's a Razzie? A Razzie is for the worst films of the year. Okay, so here's a great thing. My favorite review of North was from Roger Ebert. The review said "I hated, hated, hated, hated, hated, hated, hated this movie." He used hated like seven times. Do you pay attention to the reviews? No, I don't because I learned something very, very early on. It's one person's opinion. Some people like it. Some people don't like it. When I did All in the Family, I remember when the show first hit. I ran into some guy in the street and he said to me "That show All in the Family is the best show on television. That is my favorite show. It's the best show...that and the Beverly Hillbillies are the two best shows on television." I said "Okay." There's a great quote at Wimbledon - "Victory and defeat/if you can accept both of these impostors with equanimity" that you'll be okay. That's what you have to do. You have to do it because you like to do it. If nobody likes anything you do? Then they won't give you a chance to do it anymore. You keep getting chances. I mean your last film that played at Heartland, Flipped, was mostly poorly reviewed and didn't do well at the box-office. I do. I keep getting chances. Flipped is a great example. I loved that film. I'm very proud of that film. To me, I look at it as a companion to Stand By Me. It doesn't matter that it didn't do well. I love that film. Somebody came up to me the other day and said "Flipped is one of my favorite films. I watch it all the time." Have you ever finished a film and actually wondered if it would find an audience? I always wonder. I don't know. You never know. There's so many vagaries. There's so many variables. How much money did you spend on it? What's on opposite of it? What's the zeitgeist at the time? All you can do is just make something and put it out there and see what happens. Do you like this promotional piece? Festivals and all that. I do like it. I like meeting people. I like seeing how different audiences react and it's part of the job. As I recall, three films of yours are going to screen at the festival this year. Yeah...LBJ, Princess Bride, and Stand by Me. That should be amazing. Princess Bride and Stand by Me are both films that just get people saying "This is my favorite film." The thing that I get such a kick about is with Princess Bride, and this year is the 30th anniversary, the people who saw it when they were eight or nine-years-old and now they have kids that are eight or nine-years-old. And it has the same impact on them. The film holds up 30 years later. Yeah, there are films that you loved as a kid and you watch it as an adult and you go "What the heck?" Then, there are films that you loved as a kid and when you get older you love them even more because you're more experienced and you can look at the film and take more out of it. I have that relationship with It's a Wonderful Life. I first saw it when I was younger... I was really cool then. I got older and I started valuing life more and that movie means more to me now. I know my time is up here. I want to ask you one more question. The Independent Critic does a lot of community and social justice work. I know that you yourself have done a lot of political and charity work, but I'm particularly wondering about how and why you started Parents' Action for Children. It's about early childhood. It's about the earliest years. Science bears out that the first three years are the most important years in a child's life because the brain is developing to 90% of its adult size in the first three years and the experiences that a child has can either set him/her on the right path or wrong path depending upon what kind of parenting and environmental experiences they have. That's what I was most interested in because if you could provide a good background for a childhood when they're young they have a better chance of succeeded later in life. Thank you so very much for your time and, truly, congratulations on your Lifetime Achievement Award from the Heartland Film Festival. LBJ opens in theaters on November 3, 2017 with Electric Entertainment. You can follow the film's Facebook page for all the updates.